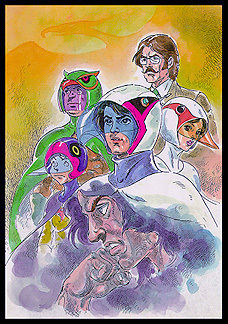 Information: The very first "Gatchaman" postcard in the Tatsunoko Time Capsule series. It would take several more years before the line was continued. This initial card was printed on a matte finish and it was illustrated by Sadao Miyamoto. This postcard was also released in two other special alternate versions. The first alternate was printed with special metallic ink, and was offered only as a promotional item. To see it, click here. The other version was printed as part of a special reprint set with a glossy finish. To see it, click here.